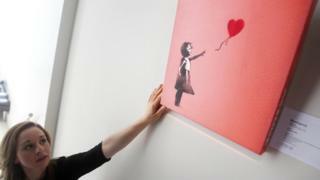 Banksy's mural of a girl letting go of a heart-shaped balloon has been voted the nation's favourite artwork. The image, which was daubed onto a London shop 15 years ago, was chosen above the likes of Constable's Hay Wain and Jack Vettriano's Singing Butler. Some 2,000 people chose their favourite artwork from a shortlist of 20 works drawn up by arts editors and writers. The Fighting Temeraire, by JMW Turner, and Antony Gormley's The Angel Of The North sculpture completed the top five. Banksy, an anonymous street artist from Bristol, painted the Balloon Girl onto the wall of a printing shop in Shoreditch in 2002. A decade later a version of the image, painted onto cardboard, sold at auction for £73,250. Then in 2014 the original stencil mural was removed from the wall of the shop to be exhibited and then sold.